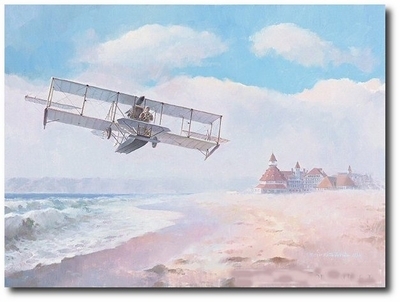 Symbolizing the rise of Naval Aviation, Naval Aviator #1, Lieutenant Theodore �Spuds� Ellyson, is seen flying Naval Aircraft #1, the Curtiss A-1, as he crosses the Silver Strand below historic Hotel Del Coronado, Coronado, California in August of 1911. The A-1 was a military development of the first seaplane to fly in this country. With the addition of another first, the retractable landing gear, this first U.S. Naval aircraft became the amphibian �Triad�, the first aircraft able to operate from land, sea or air. 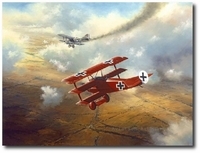 The painting was created in celebration of the 100th Anniversary of Naval Aviation in 2011.